Happy Friday everyone! and happy September, I do hope you have had a good 4 day week! I can’t believe it’s nearly the weekend already! Happy days indeed! 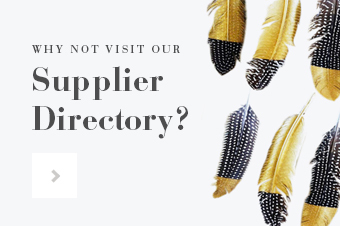 I am super excited as on Monday we launch our brand new media pack, lots of new partnership packages to launch and a brand new shiny design from our very own Laura, who has done a fabulous job putting the info together. So keep an eye out on Monday morning for the new pack. 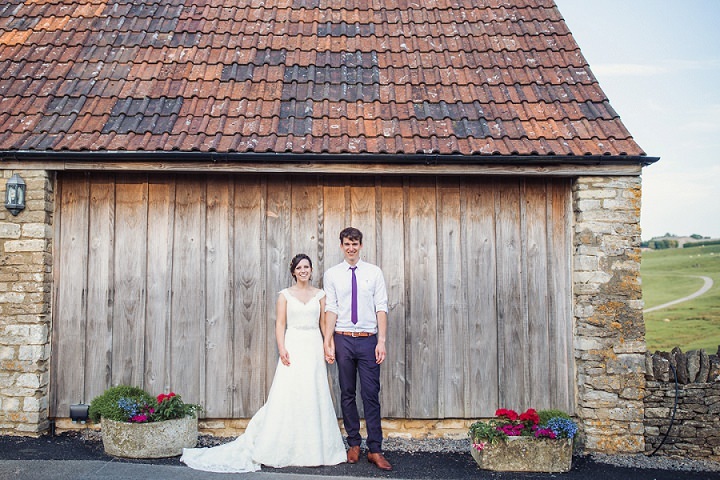 Today we have a super sunny Barn Wedding in Gloucestershire to share with you, courtesy of Courtney Louise Photography. 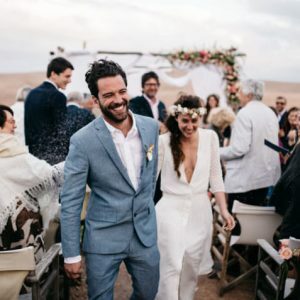 Lieha and James chose a festival theme for their wedding, which fitted in perfectly considering they held their wedding on the Summer Solstice. 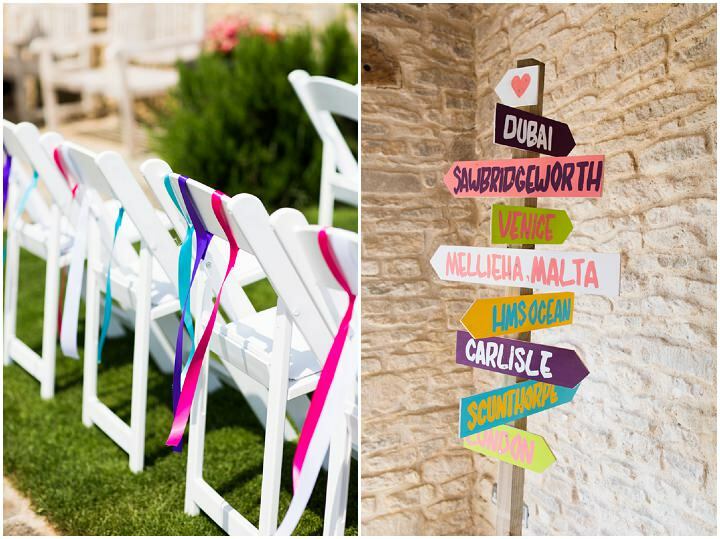 With bright DIY decor and lots of colourful details, this wedding is fun, sunny and the perfect way to end the week. 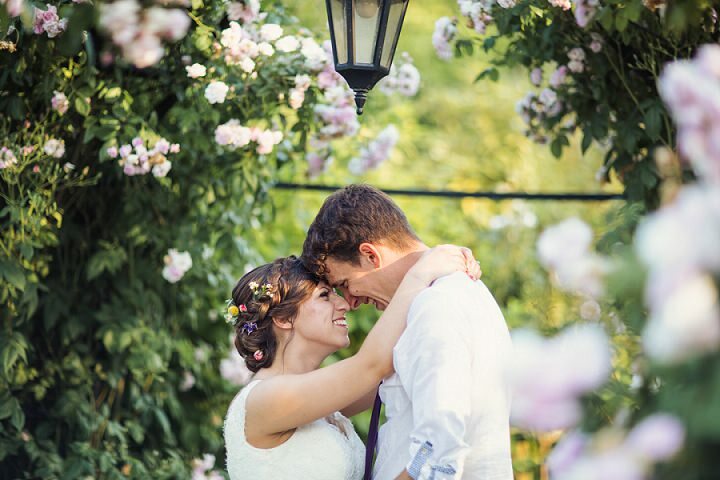 Everything came together to create our perfect day, which we will never forget. The relaxed, festival vibe ensured we could make the most of spending the day with our family and friends in the glorious sunshine on the hottest day of the year. 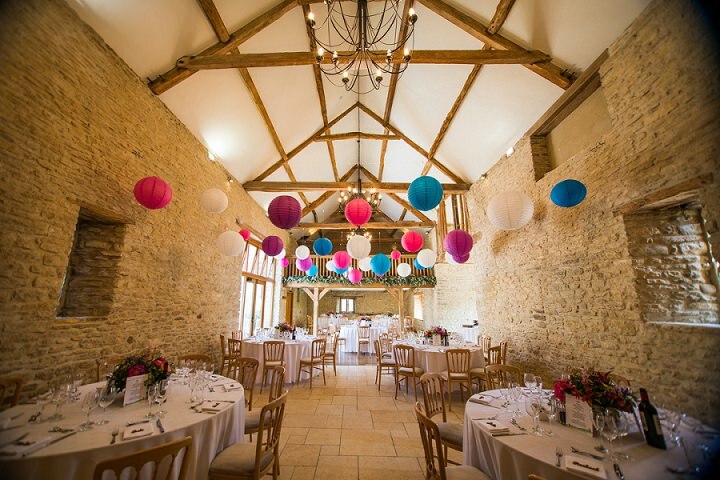 Lieha and James were married on the 21st June 2017 at The Kingscote Barn, Tetbury, Gloucestershire. 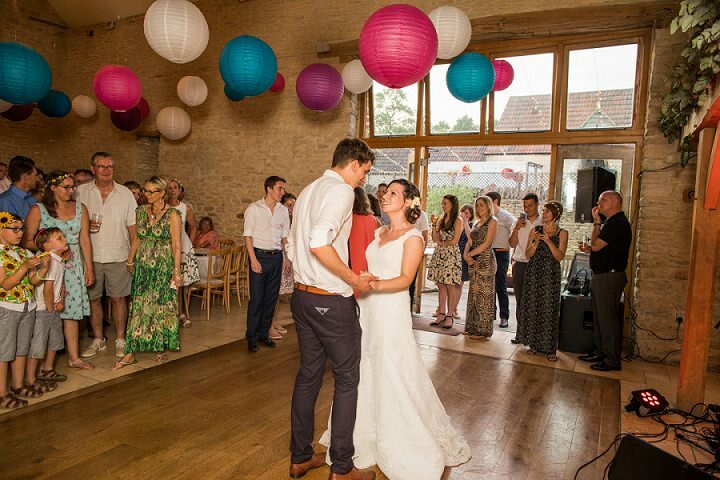 ‘I (Lieha) used to work as a Wedding Coordinator in Bristol city centre, I’d heard of Kingscote and because they had won multiple awards across multiple years. 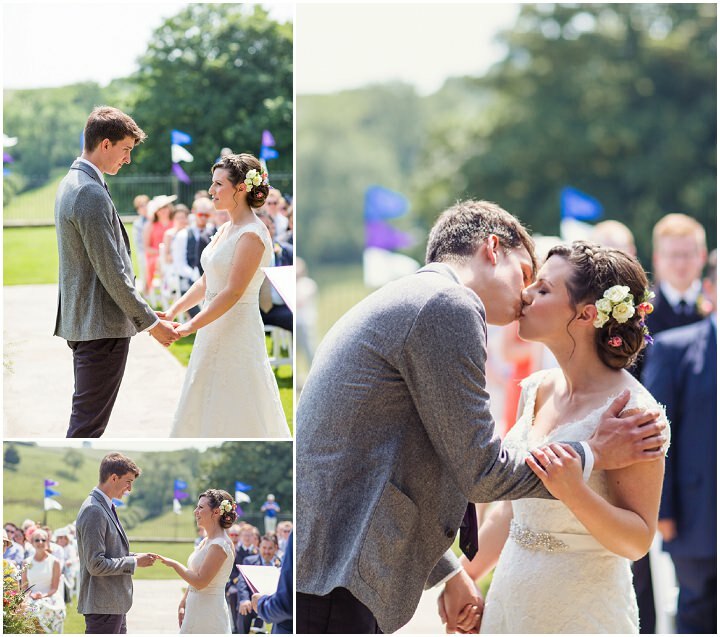 James offered to come with me to one of their open days in 2015, and despite being engaged, up until that date we had no intention of setting a date for the wedding. 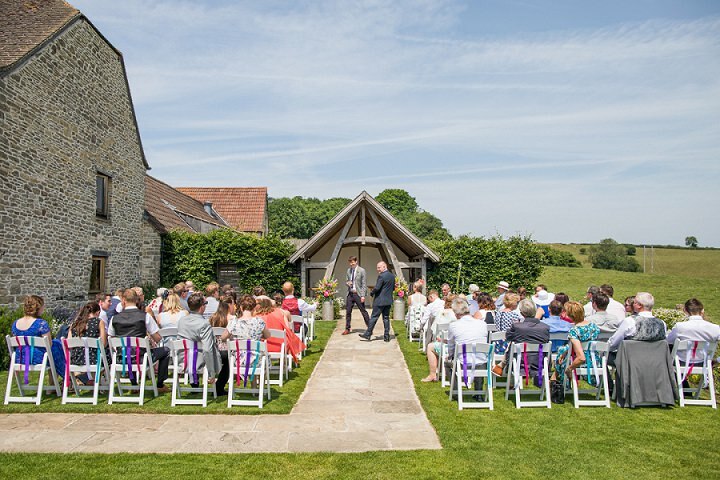 When we arrived home, we called Kingscote Barn straight away to provisionally hold the date we had just decided on; the summer solstice in 2017. 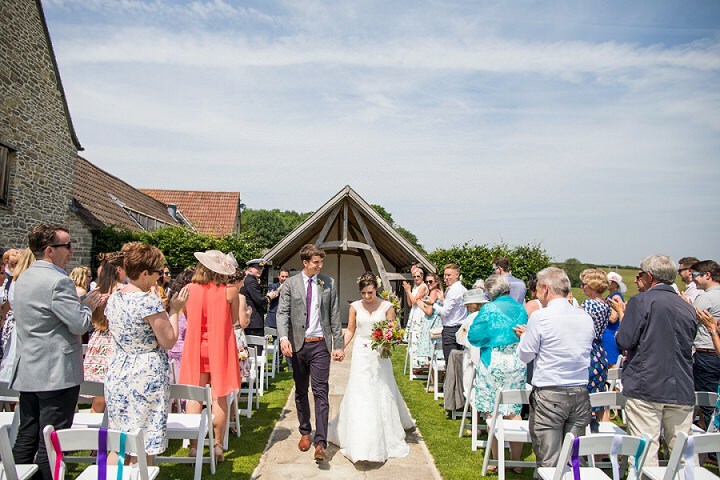 Kingscote is such a beautiful venue in a perfect setting. We were made to feel special throughout the process. We had 60 guests in the day, 68 overall in the evening. The wedding planning took roughly 18 months. We’ve been together about 6 and a half years, and we’ve been engaged since January 2014. 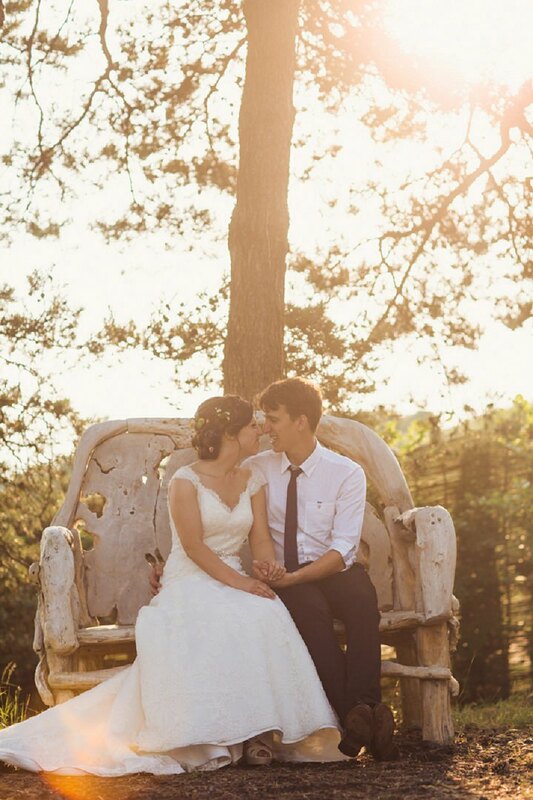 We met on holiday in January 2011, courtesy of our close mutual friend, Katie. She decided she wanted to go to Venice for a long weekend for her 21st birthday, and while she mentioned that she was bringing along a couple of her housemates, I thought nothing of it. The first few years were not easy, being long distance with me at university in Durham, James at university in Loughborough and then having a placement year in Southampton. But we saw each other as often as we could, and spent most evenings on FaceTime! Slightly unusually, we actually discussed getting married before the proposal and went out to buy the ring together before being engaged as I (James) couldn’t trust myself to choose something Lieha would like. I kept dropping hints it would be in the summertime, around 6 months away, however my plan was to propose just after the New Year. My plan was to turn the flat where we lived at the time into a wintery forest – artificial snow, paper trees and twinkly lights. On Friday I spent the time setting up, creating a picnic space and making afternoon tea in the middle of the wintery forest. 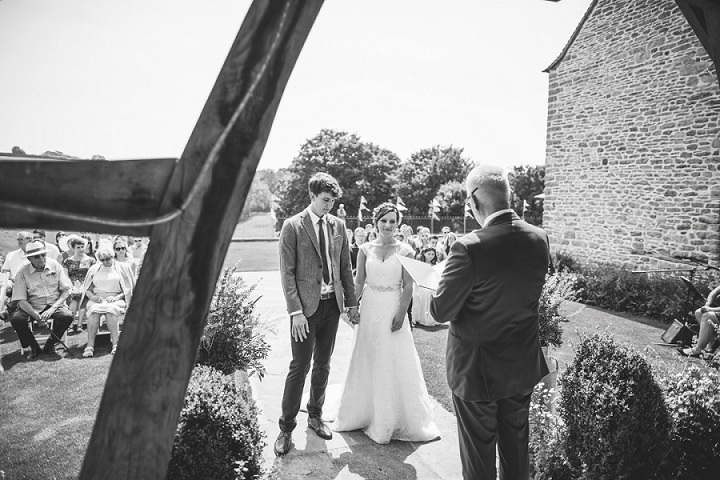 When Lieha got home from work she walked through a series of hanging photos in a wintery corridor highlighting our time together over the previous 3 years, before entering the living room where the picnic was set up. She headed over to the picnic blanket where I was waiting and after a big hug I proposed; thankfully she said yes. After the proposal we celebrated with champagne and scones before I whisked her off to a boutique guesthouse, Number Thirty Eight in Clifton, Bristol and we spent the next day relaxing at the Lido Spa. We knew it would be expensive to achieve what we wanted, so we set ourselves the ambitious task of saving £1,000 per month. We booked everything 18 months in advance to give us time to do this. We drew up a rough plan and updated it regularly to see where we were with our saving/spending. 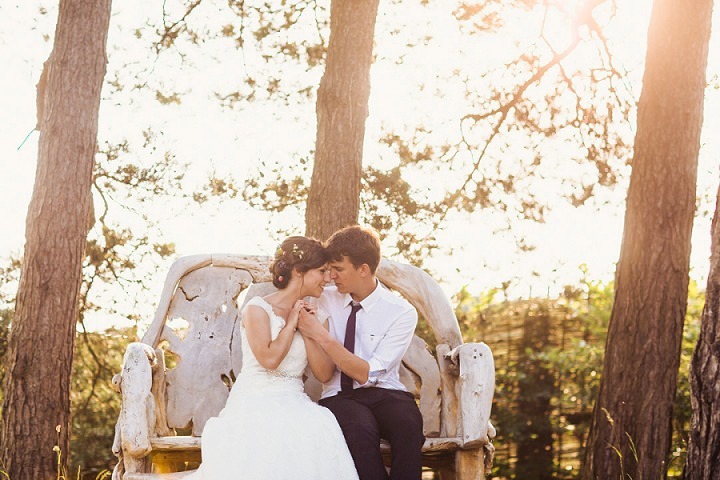 We knew the biggest costs and settled on them upfront which made it easier to budget, i.e. 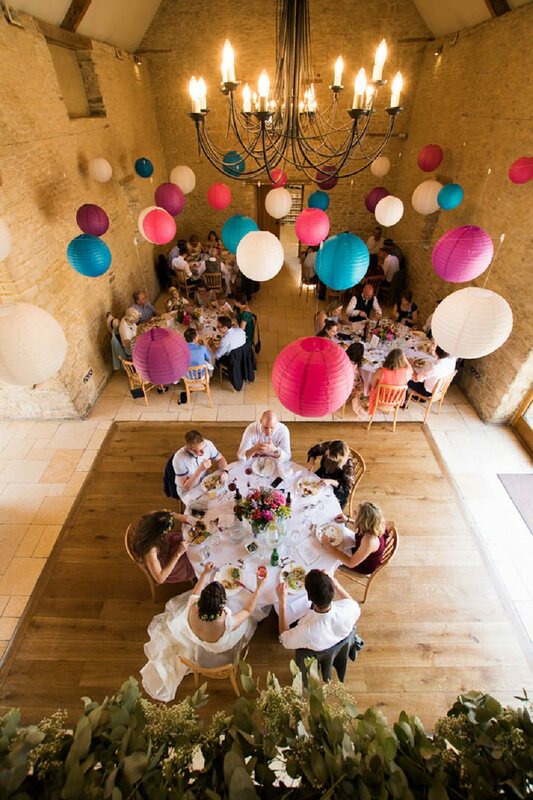 the venue, caterer, photographer etc. 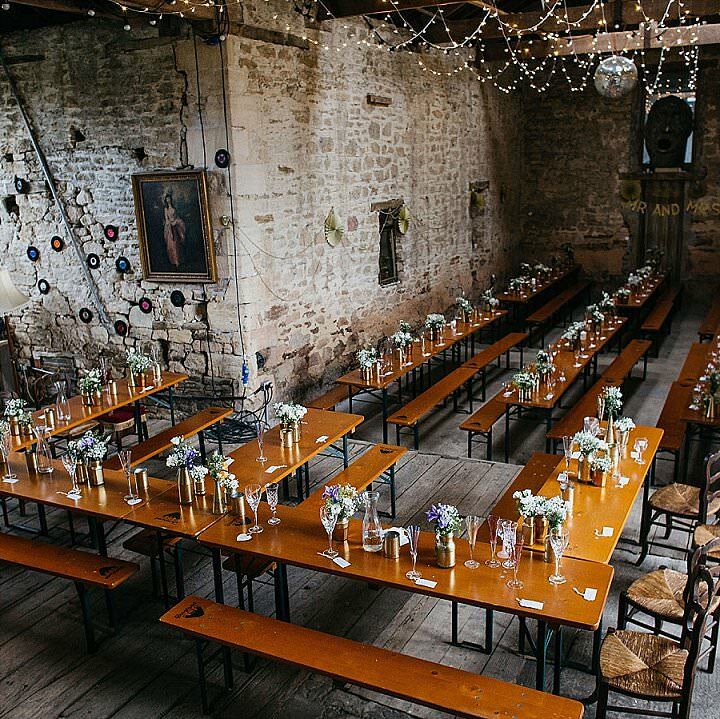 We splurged on the venue and catering, choosing the best suppliers we could. 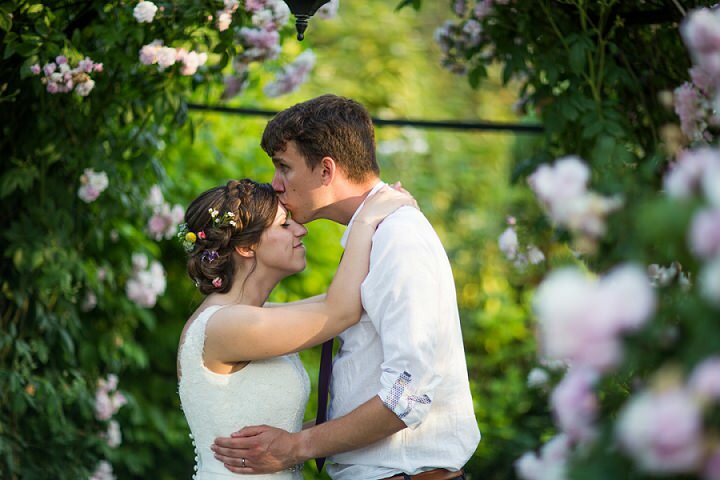 We saved a huge amount by getting married on a Wednesday, we just really wanted the solstice. We saved by working out what we could do ourselves with our skill sets and interests, and where we would need professional help. We had a long time to plan so we were able to strategically plan when we bought things, like buying wine when it was on offer. 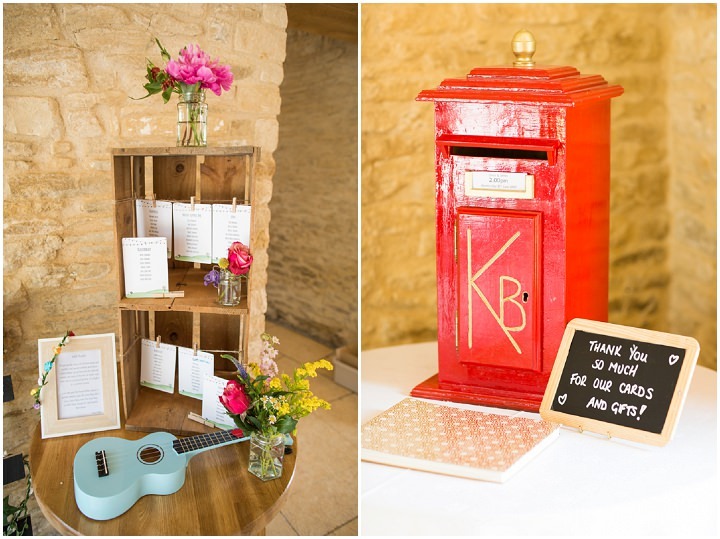 We also saved by DIYing a lot of the creative elements – all of our stationery and most of our decorations, including a photo wall, pallet signs and festival flags. 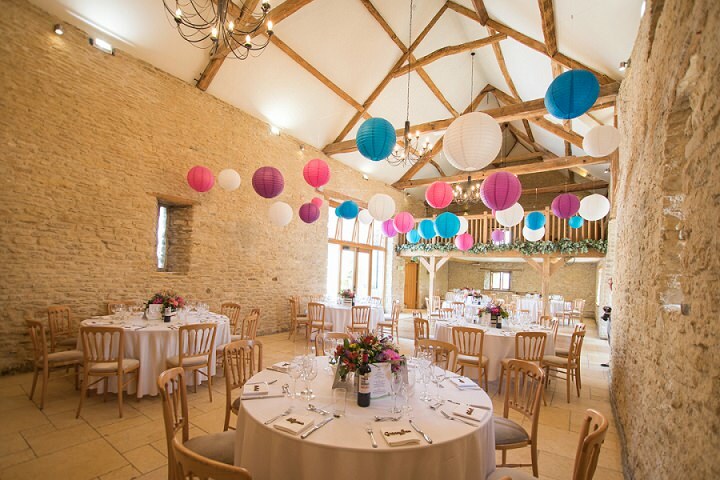 We looked at the blogs of lots of wedding photographers that worked in the local area, and ideally that had worked at The Kingscote Barn before. 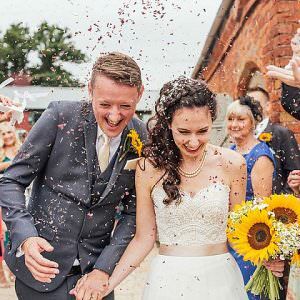 Courtney’s photography stood out to us, and we shortlisted to three photographers that all offered something a little different. 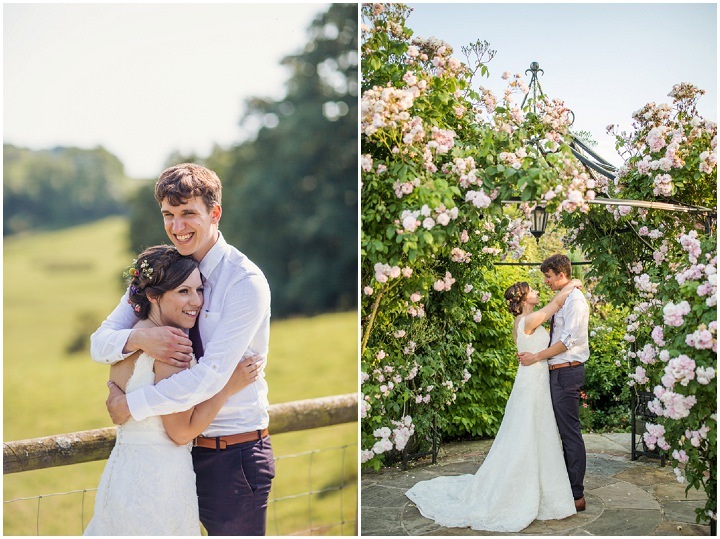 After meeting with them all, we thought long and hard about what we wanted to achieve with our photographs and decided that while we liked the styles of all 3 photographers, it was Courtney’s friendly and warm personality that won us over. 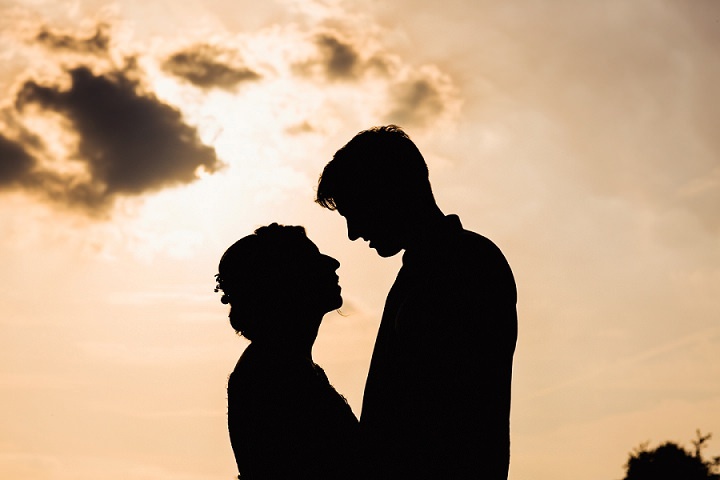 After all, your photographer is at the wedding for the entire day, with you during some of the most personal moments of your relationship, so you really have to enjoy being in their company! 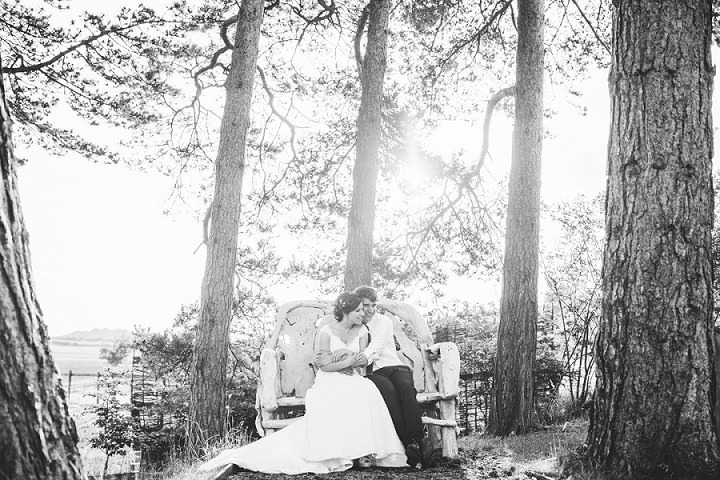 My dress was by Pronovias. My shoes were actually from New Look! 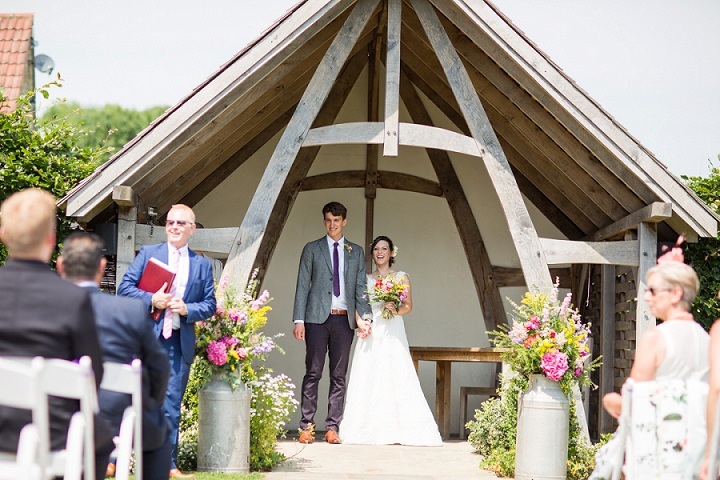 I’d looked everywhere for a pair of wedges that I liked enough to wear at the wedding, that were comfortable yet formal enough to be worn under a wedding dress and at 5”3 to James’ 6”2, not wearing heels was not an option! They were really quite comfortable and I didn’t change into flip flops until after the first dance. The suit was entirely from Ted Baker – blazer, trousers, shirt, belt and tie. The shoes were from Dune. James opted for mismatch trousers and blazer to keep it relaxed. 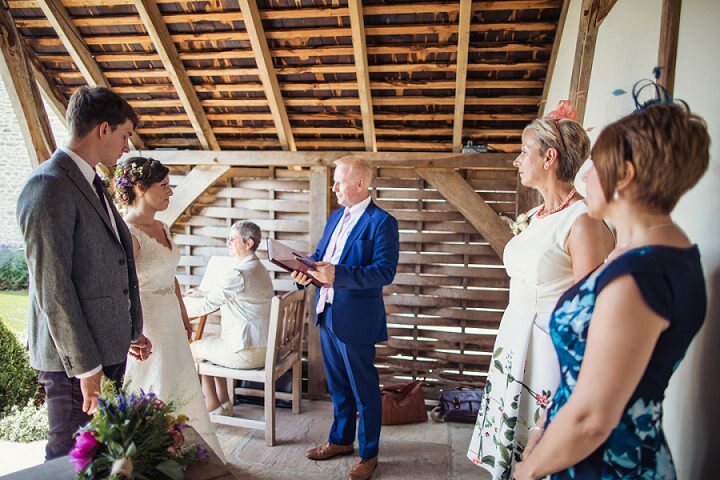 The two bridesmaids live on opposite sides of the world and have quite an age gap (9 to 26) so they were never going to end up with the same dress. Her dress and shoes were from Monsoon. Becky bought a few dresses on ASOS after a fun but unsuccessful shopping trip together, and ended up choosing the dress she only ordered as a back up as it was her favourite on arrival! 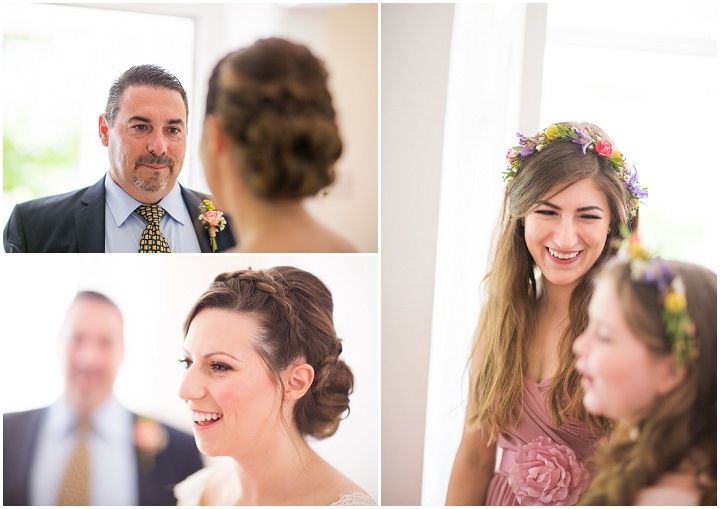 Both bridesmaids had flower crowns made by Becci at Bijoux Floral. 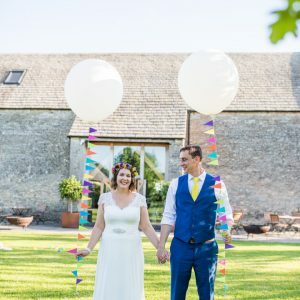 We both enjoy spending time at festivals, love colour, and wanted to make the most of our slightly ‘hippy’ summer solstice wedding date – so we chose a festival theme. 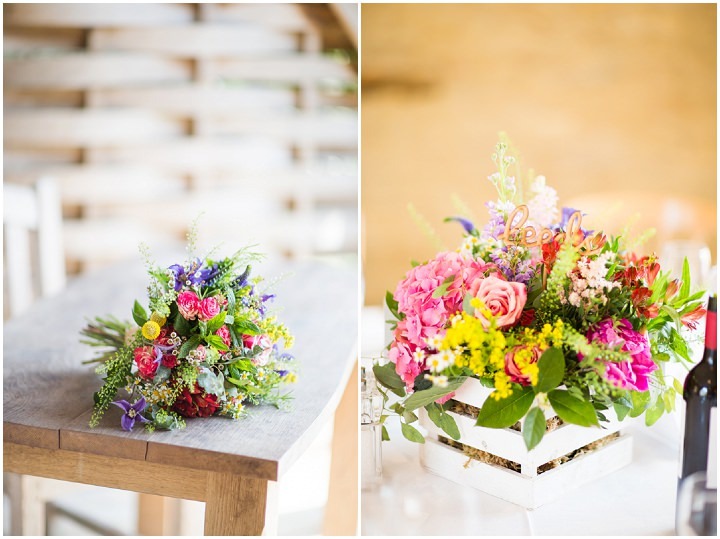 We asked for a mixture of colourful flowers to fit the theme. Trusting Becci at Bijoux implicitly, we left her to it pretty much! The flowers were incredible. 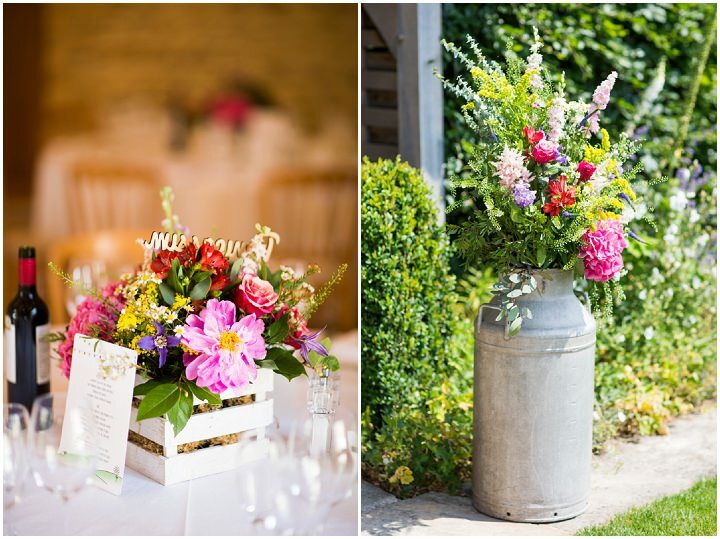 We opted for milk churns of flowers either side of the aisle, eucalyptus along the gallery in the main barn, little crates of flowers on each table and jars of flowers dotted around the venue. 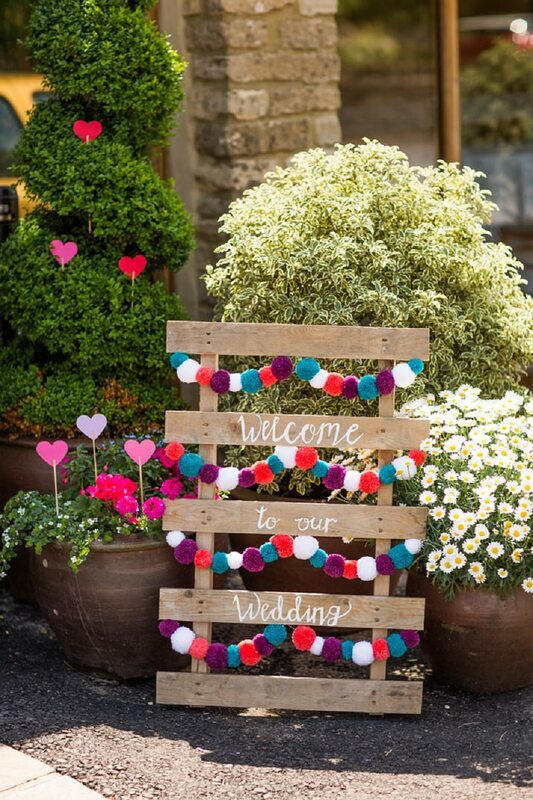 We made most of our own decorations, from the festival flags along the fence outside, to bunting and pom poms, to the pallet signs to welcome our guests, direct them to the site and tell them the order of the day. VMBespoke provided the table and place names. We also framed some quotes and poems that we both like and dotted them around the venue, along with a guitar and ukelele. 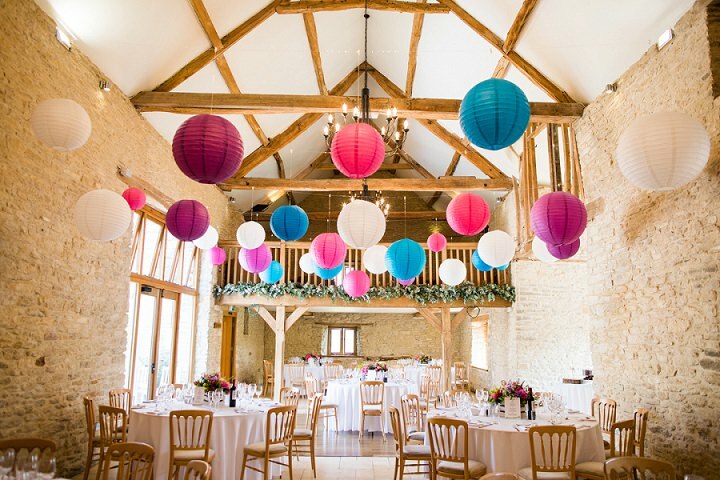 The key decoration in the main barn was the lanterns – multicoloured paper lanterns hung at various heights by Every Event Hire. They made a huge impact. 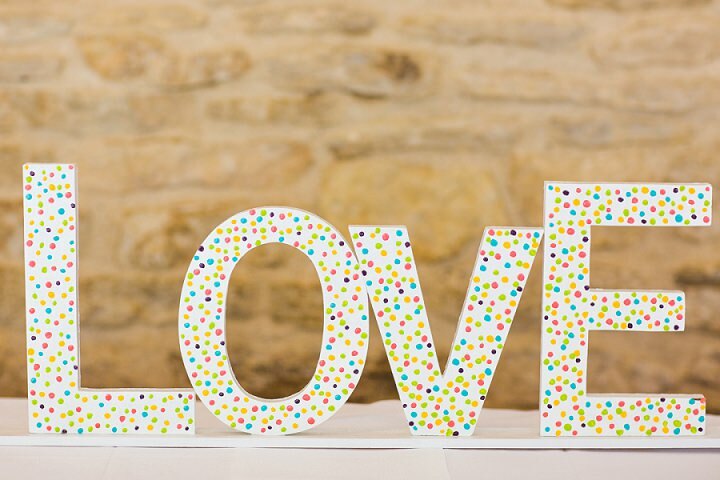 Our favourite decorations to make, and the items we thought turned out the best, were the signposts we created. 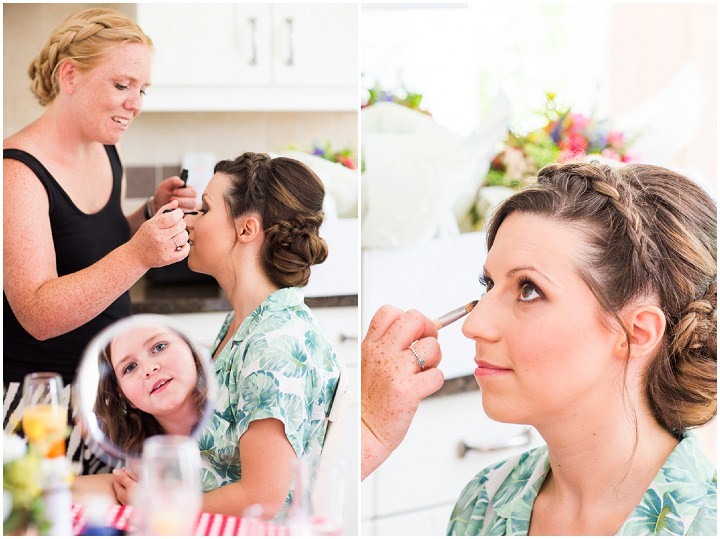 We had the help of the lovely Kirsten at The Little Wedding Helper on the morning of the wedding who ensured the set up was stress-free. 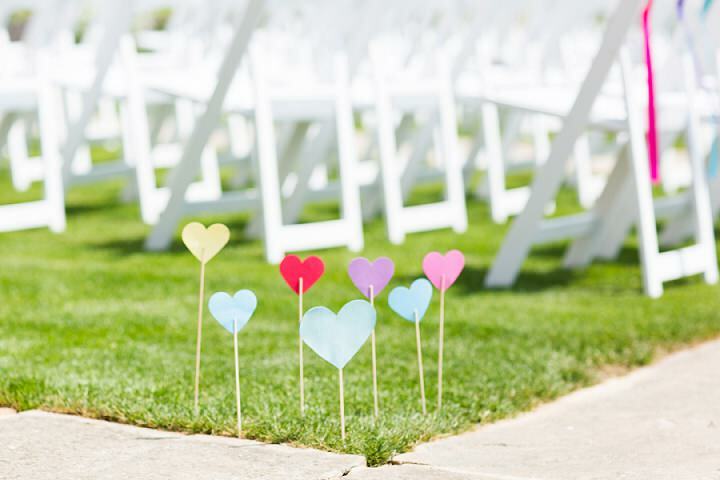 Kirsten sorted the ribbons on the back row of the ceremony chairs too, which looked great. Canapés during the drinks reception – Chorizo and fennel, prawn blinis, aranchini and bite sized scones. We had a two course BBQ – grilled halloumi, Chinese chicken, jerk swordfish, burgers, spinach and pecorino pasta salad, Caesar salad, mini roast potatoes, fresh bread and dipping oils. A secret trio of desserts to follow. 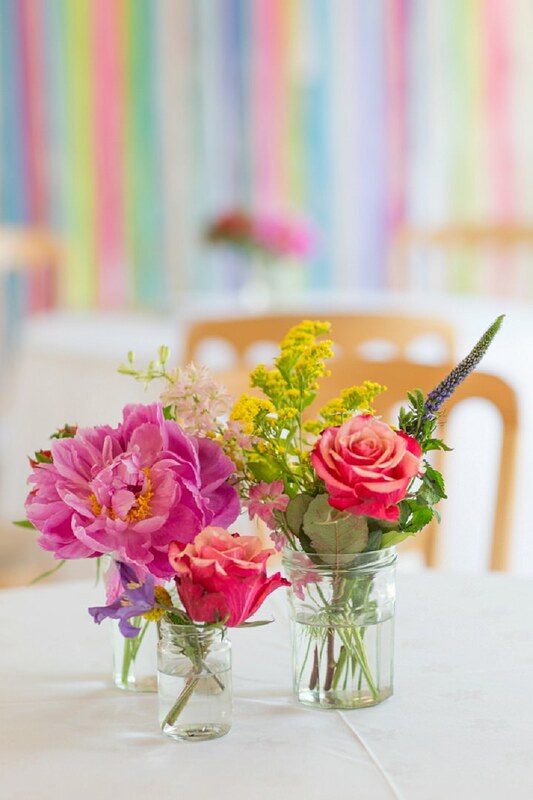 Evening catering – Ciabatta pizzas, bacon rolls and wedding cakes. 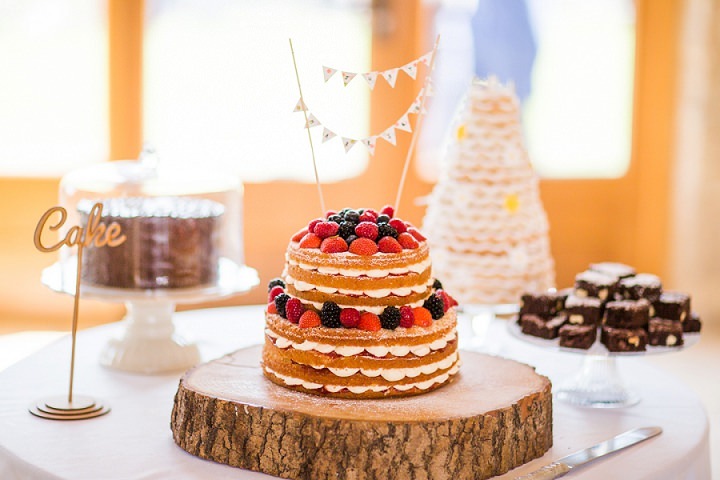 I (Lieha) made the main two tier Victoria sponge naked cake and the triple chocolate brownies with help from my mum the day before the wedding. There were a few guests with special dietary requirements, so as James’ mum has experience with free-from baking, she made a Scandinavian-inspired Kransekake and an avocado chocolate cake. She surprised us by including some decorations that adorned James’ parents’ own wedding cake 35 years ago! 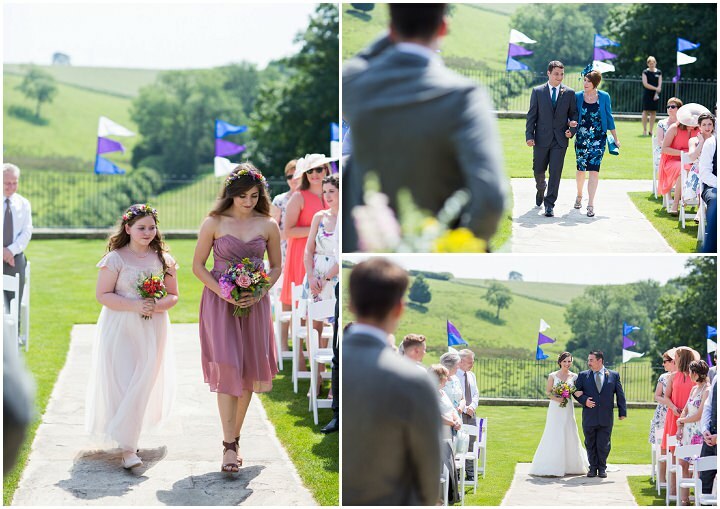 Ceremony & drinks reception – Laura Greaves, acoustic guitarist. We found Laura on a website called lastminutemusicians.com and without much time to spare, she asked us what kind of songs we liked and offered to learn 5 of our favourites. Darren Campbell Magic. 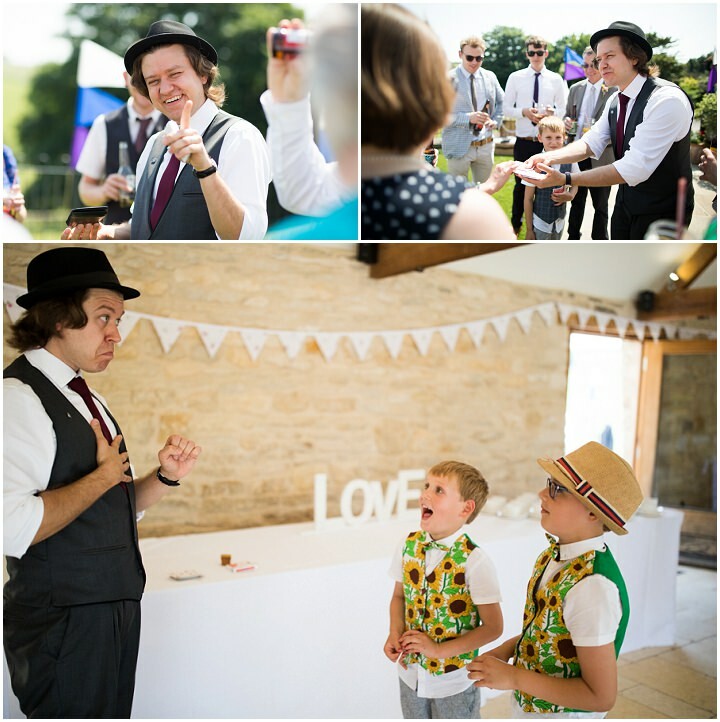 I had seen Darren’s magic a number of times before at industry events and wedding fairs, and I don’t normally like magicians but I classify Darren as in a complete league of his own! I introduced my mum to him at a wedding fair, he completely blew her away and she loved him so much, that she offered to pay for Darren for our wedding present! 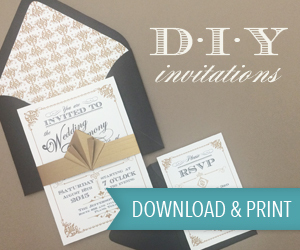 James actually designed all of the save the dates, invitations, menus and the table plan. We had them printed by printed.com. 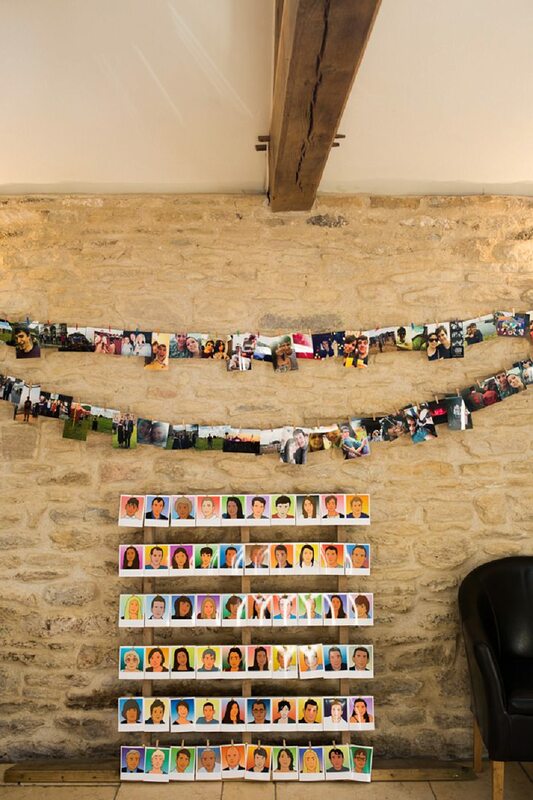 See decoration point above, but James also made some incredible Blur-inspired portraits of every guest! They were printed as polaroids, attached to a pallet and everyone could take theirs home at the end of the night. The magician, Darren, loved them so much that James made an extra one for him. The drinks reception was absolutely perfect. 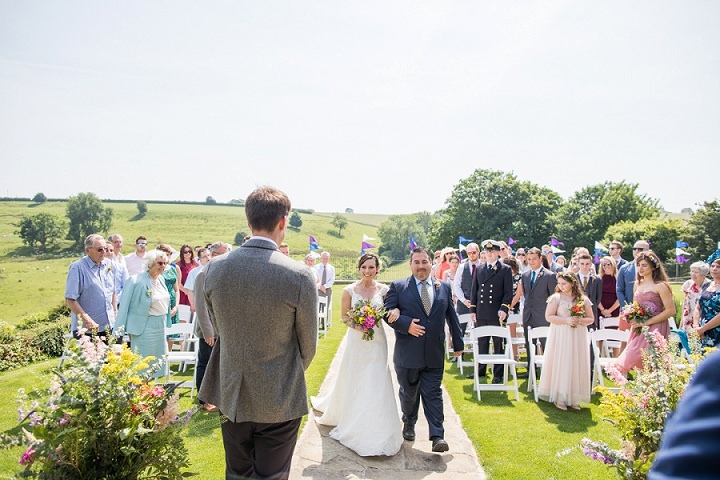 We had just had a perfect ceremony, it was 32 degrees and we were all out in the sun with the prosecco and cider flowing. I finally got to say hello to all of the smiling faces, it was great to be surrounded by our incredibly excited guests and realise that you have so many lovely people in your life. At that point in the day it still feels like you have so much of the day left to enjoy too, so it was definitely our favourite part. James – Make sure you make the most of everything you have set up – ensure you see and enjoy everything that you’ve done as it’s so easy to miss the little things. 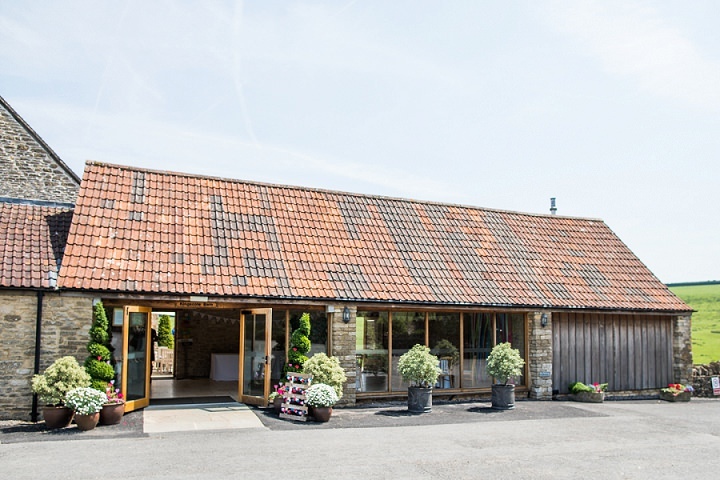 Lieha – Plan as much you can in advance and make sure multiple people know the plan in detail (preferably your carefully chosen suppliers, not family members!). On the day, you can then hand over full responsibility and relax and enjoy your day instead of worrying about anything. 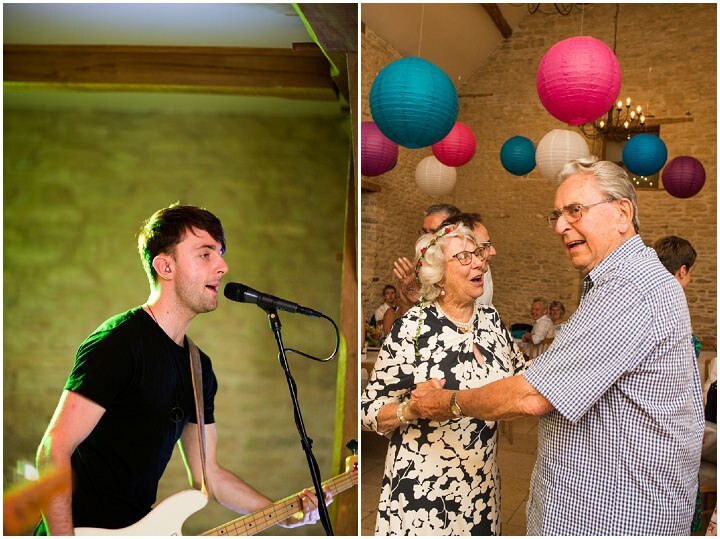 The biggest surprise was mum’s very last minute speech – I think we added it to the list just the day before! She managed to make everyone cry in about 5 seconds flat with her lovely story about first realising how much James cared about me when I was in hospital quite early on in our relationship. And she was first to give her speech, so everyone else had to follow her! 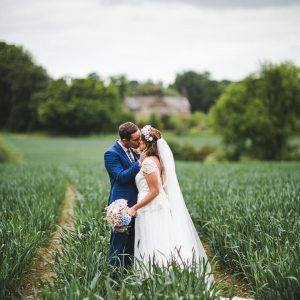 I AM A COTSWOLD BASED FEMALE WEDDING PHOTOGRAPHER, COVERING THE UK AND BEYOND, WITH A RELAXED AND UN-OBTRUSIVE APPROACH.